By the way, lots of these pictures feature my good friend EdHill He sadly passed away in 2016 and if you want to read about him, and you should because he was a great person, go here. 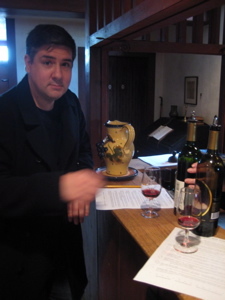 I know nothing about wine and quite frankly, I don’t really care to know all that much either. I know what kinds I like; Dry rather than sweet, citrusy rather than floral and more often white rather than red. That would be your Sauvignon Blancs from New Zealand – Delicious. Once in a while I can do a strong red or a legit Rose and I know I hate Reislings and dessert wines and “oaky” Chardonnays. Good enough for me. 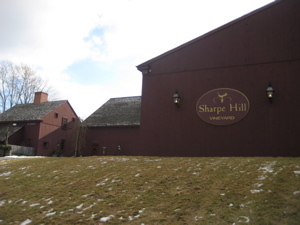 Sharpe Hill is, for the record, is Connecticut’s largest and most award winning winery. There are no signs for Sharpe Hill (at least the way we came up via a very tiny road from Route 6) and the roads leading to it definitely have a, “I’m taking you out here to chop off your limbs and scatter your remains in the deep, dark woods” feel to them. Or maybe that’s just me. Ed did look at me kind of askance when I mentioned that little tidbit to him. 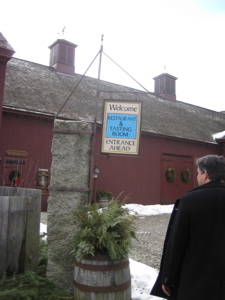 We rumbled down the teensy snow and ice pock-marked road and finally came to the winery. Wow. It’s housed in a rather beautiful brick-red building; surprise number one. We parked in an empty lot (not a surprise) and I made the bold decision to leave the car unlocked. 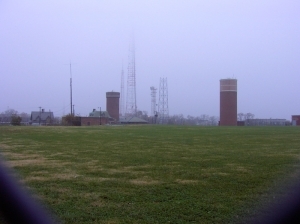 The place was deserted, but we forged ahead. The old barn door creaked open and we were suddenly in a pleasant, if slightly spartan, reception area. “Hello?” An attractive woman immediately appeared from the back and gave us a look as if to say, “Wow, it’s February… And I have visitors! Who wants some wine?” It was weird; it felt like we were so isolated from the world for some reason… but whatever, let’s get to sampling. Although growing grapes in northeastern Connecticut provides us with the challenge of harsh winter weather, our vineyard (which is situated on a 700 foot slope) provides us with a microclimate that mimics many of the wine regions of Europe. In fact, our latitudinal location is comparable to that of Rome, Italy. Our vineyard’s microclimate affords us the luxury of growing such vinifera grapes as Chardonnay and Cabernet Franc. We planted our first grapevines in 1992. 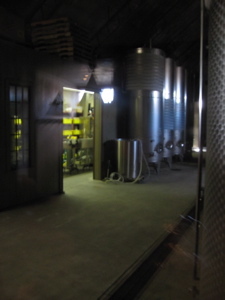 The vineyard has now expanded to 25 acres, which include plantings of Chardonnay, Melon de Bourgogne and Vignoles for white wines; and Cabernet Franc, Carmine and St. Criox for red wine. We are continuing our vineyard expansion program with plantings of Riesling, Dornfelder, Gamay, and Landot Noir, which will begin to produce crops with this year’s vintage. The woman at the counter serving us seemed slightly perplexed (but not off-putting in any way) that we were there – and taking pictures. But then she mentioned that she was currently reading “Lord of the Flies” which propelled us into a discussion about classic literature. She then allowed that she’d recently read “Anna Karenina” to which my only reply was, “My two-year old likes to thumb through that book which is sorta cute.” Ed mentioned that my wife Hoang and I are reading The Modern Library’s Top 100 books and therein lies the tenuous tie-in to my title. 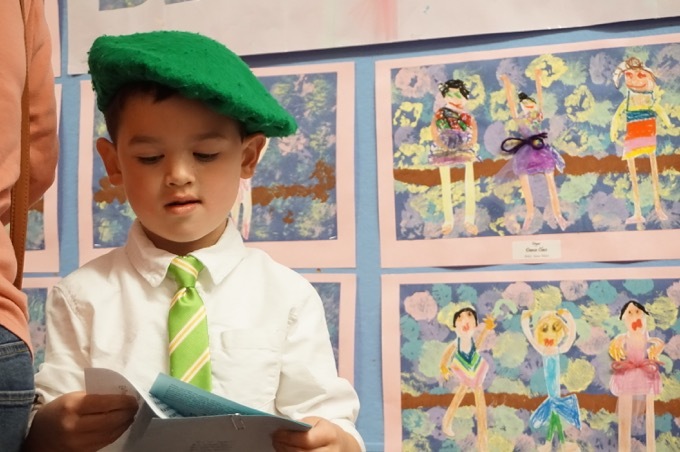 “The Grapes of Wrath” is # 10 on the list and EdHill is a HUGE Star Trek fan. So there you are… it works after all. For 5 bucks we enjoyed several wine samples and good conversation. 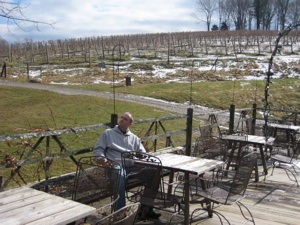 This place, I’m sure, is very nice come spring and summer as the restaurant is one of the best around. You can take a self-guided walk into the vineyard and enjoy the view at the top, which overlooks portions of Connecticut, Massachusetts and Rhode Island. We chose not to do that though because, well, Ed’s not too keen on that uphill thing. 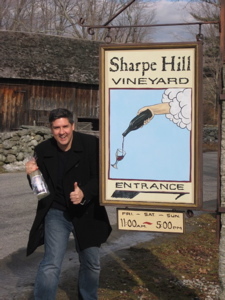 My husband and I like to take trips to the various CT wine vineyards around the state and we have noticed that there are no books that go into detail about the history behind these vineyards. WE would like to start writing and compiling a book together about all of the CT vineyards not just the ones that give enough money. Do you have any suggestions as to who we should contact in relation to this?